As well as low-rise and high-rise window cleaning, we also offer pressure washing and eavestrough cleaning. Horn’s Window Cleaning provides quality window washing in Calgary for industrial and commercial properties. We have over 30 years of experience and we are very professional. When operating our window washing equipment, safety of our window washers as well as the people inside or outside the building is taken very seriously. Our employees are prompt, courteous and qualified, and we offer affordable pricing on our window cleaning services which also includes eavestrough cleaning and pressure washing to get rid of stubborn dirt and moss buildup. We specialize in servicing high-rise, mid-rise, and low-rise buildings, commercial businesses, condo/strata complexes, and hard-to-access locations. Our services are ideal for building operators, building owners, condo boards, or property managers. Need a Hard-to-Reach Location Cleaned? Some buildings don’t have roof access, or have an overhang that makes rope access unsafe. At Horn’s Window Cleaning, our window washers can now safely access hard-to-reach locations with our specialized Teupen Leo 30T. This lift can be set up on landscaped areas or uneven surfaces that typical wheeled lifts can’t access – we figure out how to do the jobs other companies can’t or won’t do! 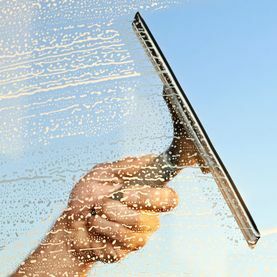 Call or e-mail us today to ask about our window cleaning services or to request a free estimate. Taking Window Cleaning to New Heights! Our extreme access lifts allow us to clean hard-to-reach areas on your building. Let us know what services you need and we can give you a free estimate.